This week has been a bit dragging. It's the end of February (yay!) and I think everyone is ready for a fresh burst of Springtime. Our daycare provider has been sick all week, and it is stressful scrambling around every night trying to figure out who is going to stay home with the Littlest. 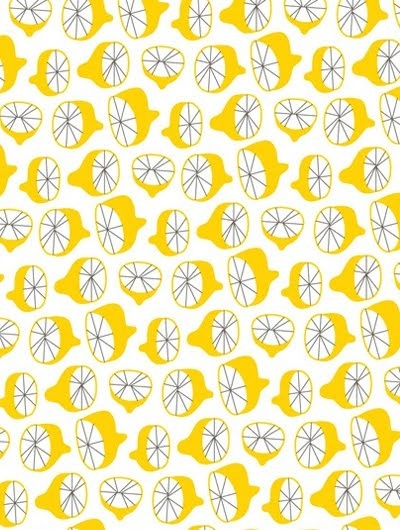 I am in love with this vintage-inspired lemon print. It's my reminder of the day to remember to look on the bright side... you know... when life gives you lemons?! Here are my five faves of the moment. one - Countdown is ON until we are relaxing in sunny California. I cannot wait! two - spending lots of time with the Littlest this week, specifically baking banana bread with him at 7:30am before anyone else was up. It was such a special start to the day, just the two of us busy in the kitchen. three - warmer weather. Thank goodness. four - Ballet Barre class. I'm nearing the end of my two-month membership, and I have loved it. It's a great feeling to work different muscles that you never use, to wake up to that slightly achy feeling that reminds you that your body has actually challenged itself. five - a date with my husband on saturday night. We do go out regularly, but often it's for a birthday, a party, or big gathering. This week we're just going to a local pub for drinks, but the baby-sitter is lined up (thank you grandparents) and I'm looking forward to relaxing for a couple of hours. It's so crazy to think that we used to be able to do those things any. time. we. wanted. Life before a baby! Have a lovely weekend, whatever is on your agenda! Linking up with Falling for Friday. That is a super cute wall paper! Oh no, I hope your nanny gets better soon so things can settle down. That is super stressful! Happy to have you on Falling For Friday! Newest follower here! I found you through the blog hop! You have a super cute blog, I can't wait to read more! Oh warm weather... what I wouldn't give for some!! and hurray for date night!!! Enjoy some time with your husband... you deserve it momma! Thanks for linking up with us for Falling for Friday my friend! oh yes! it´s definetly time for fruit prints! I love them and the lemon prints are so pretty!